Clarence’s father was born in 1830 near Charlottetown, PEI. He went to Scotland to study for the ministry, fell in love with Margaret Tate and married her. He brought her to Canada in 1859. They settled in Hopewell, near Truro, NS. Their first 5 children all died of scarlet fever. Subsequently son George was born followed by Clarence and later by Albert all of whom lived to manhood. Clarence’s grandfather and then his own father belonged to the Free Presbyterian Church They believed “in the obligation of the State to maintain the ordinances of religion.” The United Presbyterian Church on the other hand believed in free-will offerings by congregations to support their cause. Union of the The Free Church and The United Presbyterian Church eventually happened in Canada well before it happened in Scotland. In 1881 (Clarence was 15) Mother wanted to visit Scotland, visit their relatives, re-unite with the land of her birth, etc. The voyage was a disaster. Their sailing ship had to keep most of its sails furled because of high winds and a wildly restless sea. When the winds calmed down, their approach to land was delayed for a week until a wind again arose to push them to harbour. Mother’s nerves were frayed by the voyage. On a doctor’s advice she refused to return to Canada. Father sent his resignation to Georgetown, PEI, where he was a minister in a Presbyterian church & the family stayed in Scotland. Although the famous convention of all the Canadas was held in Charlottetown, PEI in 1867, Prince Edward Island “stayed out of the Dominion with a fiery determination to blaze its own path.” By 1873 the Island needed a railroad and the Dominion had the money they needed to build it. July 1st the Island entered Confederation. That railway started in Georgetown and ended in Charlottetown. By 1888 (Clarence was 22) his father had died and the three brothers (George, Clarence and Albert) were all at University of Edinburgh. (The only general degree courses available at that time were Greek, Latin, Mathematics, Philosophy, English, Physics and Moral Philosophy.) In 1889 he took his MA degree and then entered the study of Theology. Clarence was an enthusiastic learner. He had, in school, won several prizes in Mathematics. He entered Theology on winning the second highest scholarship at the University. 1859-Darwin publishes On The Origin of Species. In 1893 at a meeting of the Maritime Synod of the Presbyterian Church two sermons were preached which “revealed the Church in transition from the old theological method of preaching with its “plan of salvation” to the new and more human form arising out of the great evangelical movement …” Clarence was not only developing the Style of his preaching but also the Content and Thrust of it. After three visits to Canada to work in mission fields Clarence returned to the land of his birth to seek his living. His first call was to Middle Stewiacke, NS. On Sunday, July 24th he purchased a bicycle (with newly invented pneumatic tires.) He comments that he was probably the first cleric in Nova Scotia to use “this new contraption” in the work of his ministry. Roads were mud and riders were spattered with it. He remarks that he wasn’t able to dress appropriately as a clergyman while so traveling. In 1896 Clarence returned to Scotland for a visit. There he met, became engaged to and married Mary Tait. They returned to Canada and his ministry. From Eastern Canada during this time Clarence noted “distractions in the west.” With uncharacteristic venom McKinnon comments on Riel: “… infatuated half-breed … in a moment of madness shot Thomas Scott … irresponsible person … half-demented troubler of the West …” Thomas may have been a fellow Scot, but Clarence apparently hadn’t heard that he had personally insulted/denigrated Riel before the latter acted. History, however, has smoothed all this out. In 1899: MacKinnon received a call from Park Street Church in Halifax. He was inducted April 26. The Boer War in South Africa started that same month. He noted the number of young Canadians who, in support of Britain, crossed the Atlantic to join the fight. In 1902: MacKinnon received a call to St. Andrews Church in Sydney, NS. In that year a General Assembly of the Canadian Presbyterian Church was held in Vancouver. MacKinnon and a colleague went by train to attend it. The third group to eventually merge with the other two was the Congregationalists. They originally formed as a protest offshoot of Henry 8th’s Anglican Church. Thirty five of them arrived in North America on the Mayflower and became known as the Pilgrim Fathers. The denomination developed (and sometimes split) in the US; the main body conservative with a strong Bible-based faith. In 1988, a number of UCC congregations separated from the national church, which they felt was moving away theologically and in practice from Biblical Christianity. Many of the former UCC congregations banded together as the new Congregational Christian Churches in Canada. The name “congregational” generally describes its preferred organizational style, which promotes local church autonomy and ownership, while fostering fellowship and accountability between churches at the National level. The early Congregationalists believed the adult conversion experience was necessary for an individual to become a full member in the church. In 1905 MacKinnon’s colleague at St. Andrew’s Church, Cape Breton Island died leaving him with the heavy burden of serving that church all alone. He then received a call from Westminster Church in Winnipeg. The call had been signed by 232 members and 210 adherents. 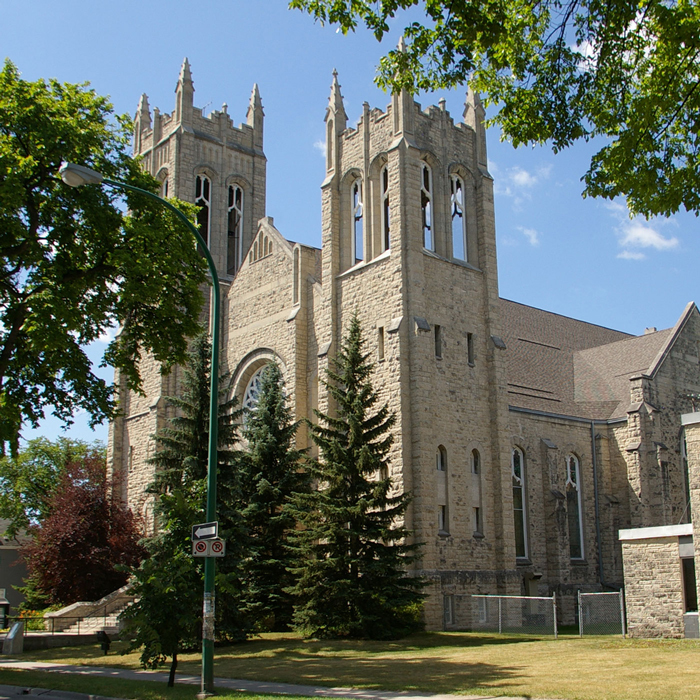 Interesting sidelight to McKinnon’s ministry: In 1903 a young man, Sidney Smith, moved to Winnipeg and joined Westminster Presbyterian Church. He and a Westminster elder, John Bellingham, were to become co-leaders in a popular Sunday afternoon Adult Bible study class. At the February, 1905, congregational meeting held to discuss the calling of a new minister, Smith and Bellingham both stressed that the person chosen should be “sound in doctrine, evangelical in spirit, and earnest in purpose.” McKinnon obviously met their criteria. When McKinnon, towards the end of his stay at Westminster and speaking at a meeting of elders, expressed the concern that many of the children in Winnipeg’s burgeoning west end were not getting the opportunity to hear about Jesus, he expressed the wish that someone in the congregation would undertake to deal with this problem. In 1910 Smith and Bellingham rose to the challenge, left Westminster and moved their bible class to a small building at Ellice Avenue and Beverly Street. Their story and what that move led to is told in another part of this website. The MacKinnons arrived on Friday, May 15 and he was introduced to the congregation on Sunday, May 28th. Rev McKinnon was obviously given to expansive oratory with colourful metaphors and a dramatic flair. The MacKinnon ministry at Westminster ended in 1909 when he was invited to become the Principal of Pine Hill Theological Seminary a position he held for 28 years. In 1914 when WW I intervened MacKinnon enlisted in 1916 and served overseas as Chaplain with the “Highland Brigade” an amalgam of four battalions raised in Nova Scotia. After the War, MacKinnon returned to Pine Hill as well as to a number of government jobs as chair of this committee and that conciliation investigation. He also was in demand as a speaker, taking engagements in both Canada and The United States. In short he proved to be a man respected for his intellect and for a mature and compassionate personality. In 1924 he was elected Moderator of the Presbyterian Church in Canada, the last so elected before union in 1925.